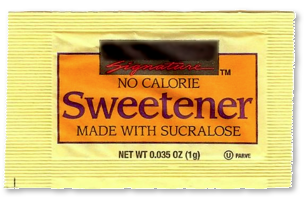 Sucralose (marketed as Splenda) is an artificial sweetener chemically derived from sucrose. Sucralose comes from a complex chemical process that includes phosgene. Phosegene was used as a chemical-warfare agent during WWI. It is now a common intermediary in the production of plastics, pesticides and dyes. Three atoms of chlorine are selectively substituted for three hydroxyl (hydrogen and oxygen) groups naturally attached to the sugar molecule. It is better known as trichlorogalactosucrose, or sucralose. This new chemical substance is identified by the manufacturer as a chlorocarbohydrate. Chlorinated carbohydrates belong to a class of chemicals known as chlorocarbons. Synthetic chlorinated compounds bioaccumulate in the body. Many cause developmental problems in the womb or are carcinogenic. More details can be found in this article by The Ecologist. Splenda is ~ 1% sucralose. The remaining ~ 99% ingredients are dextrose and maltodextrin. Both are obtained during high-fructose corn syrup manufacturing. Typically these processes use corn feedstock and enzymes that are genetically modified. Maltodextrin is a product of hydrolyzed corn starch. It supplies free glutamic acid which is an excitotoxin. Because a serving of Splenda is less than 1 gram, the manufacturer can legally claim that a serving has zero calories. This deception has repercussions for diabetics and others who believe they are consuming a non-sugar sweetener. Beware of sucralose used in "trusted" products. For example Airborne contains sucralose, along with other problematic ingredients.